This came with some changes in how their pricing structure worked, as well as with the promise of being even more streamlined than the original. This begs the question: Does GoCentral deserve to be as famous for hosting as GoDaddy is for domains, and are the packages worth the price? Although many of these website builders seem to have idiot proof and straightforward pricing, it’s often the case that there are other hidden costs. These are usually related to domain registration, WHOIS privacy, and other services or features that have inflated prices or increased renewals, and I’ll point these out. Unfortunately, this is one area where GoDaddy’s pricing falls way behind other builders. Competitors like Wix, WordPress, Weebly, SimpleSite, JimdoJimdo, and many more offer a free plan you can use for an unlimited amount of time. By contrast, GoDaddy offers only a 30-day free trial. Afterwards, you’ll have to subscribe to one of its pricing plans. However, unlike the other website builders, if you’ve already purchased a domain name, you can already host your website on a custom domain with a free trial. Although this might sound great, you get a free domain for a year once you subscribe, so there isn’t really a point to buying a domain before that unless you already happen to have one. GoDaddy’s free trial works a bit differently, as you can try out the full feature set of the plan you want to trial. You can even start using the online store features, to some extent, which means you can get your website fully up and running before your trial runs out. Few other free plans or trials let you use any of the e-commerce features, which make this the best aspect of GoDaddy’s free trial. How Do GoDaddy’s Paid Plans Compare With the Competition? Comparing GoDaddy’s pricing structure with that of other popular website builders, it’s clear that GoDaddy’s plans are among the most affordable. Excluding free trials, WordPress is one of the only popular builders with a cheaper plan (i.e., the Personal plan). Wix, SimpleSite, and Site123 start at almost double the price, and Jimdo starts at a couple dollars more. GoDaddy’s most expensive plan, with all of its features plus e-commerce functionality, costs only around $20. That’s almost half the price of the top-tier plans of all the other builders except for WordPress and SimpleSite, which cost only slightly more, and Site123, whose lone paid plan costs around only $10. Accepting Payments and Monetizing Your Website? Arguably the biggest milestone in any type of pricing structure is when and how it allows you to monetize your website, especially through payments. GoDaddy offers a simple PayPal button to accept payments or donations beginning with its second plan, Business. WordPress allows you to do the same, while Weebly provides more advanced e-commerce for a little cheaper. Jimdo and Wix (with their new pricing plan) allow for payments only for almost double the price. Site123 is the only one that provides its maximum e-commerce functionality, limited as it is, while SimpleSite charges a bit more for basic e-commerce features at a similar price. All of GoDaddy’s e-commerce features are unlocked with its most expensive plan, at around $20. It’s not the most comprehensive e-commerce builder, and you can get similar features with SimpleSite for around $30, with Weebly for $25, with Jimdo for the same price, and Wix for $20. WordPress.com doesn’t provide the same level of e-commerce capabilities and can’t be compared, even though its Business plan is more expensive. If we compare this pricing with e-commerce-focused builders like BigCommerce and Shopify, then GoDaddy’s online store plan costs less than even their cheapest options. However, its features don’t quite match up to those of these two e-commerce giants. Feel free to learn more about them by reading our BigCommerce expert review , or our Shopify expert review . Does Every Plan Have Its Place? If you have a specific web-hosting solution in mind with specific requirements, then you should also look at GoDaddy’s prices on an individual basis to decide whether there’s one that’s perfect for you. If one builder’s pricing structure is generally better than another’s, it could still be the case that this other builder has a single plan that’s more suited to your needs. As GoCentral doesn’t really have a free plan, we can skip straight ahead to their most affordable “Personal” plan. This is one of the cheapest plans around, period. As such, it’s probably one of the most attractive plans for individuals who want to run only a simple blog with only the most basic features. The “Business” plan already includes a simple PayPal button as well as SEO tools. This should help you find more customers in the competitive online space; however, the simple PayPal button can’t be considered enough for an e-commerce business. This makes this plan suitable for small businesses or small-time sellers who just want to get noticed, and it’s still cheaper than most alternatives. Next up is “Business Plus,” where you still only have a simple PayPal button. However, you can now create email marketing campaigns, set up business results for Google Search and Maps, and integrate with social media. These are indispensable tools for a business that needs to constantly pick up new customers and keep them in order to survive. If you’re a small-to-medium enterprise that doesn’t require e-commerce capabilities, it’s a great choice and much better than the normal Business plan. Last, there’s the “Online Store” plan that comes with all the above features as well as full e-commerce functionality. This plan comes with a surprising depth of features like shipping and tax calculators, product reviews, and abandoned cart recovery. However, it’s not quite suitable for enterprise e-commerce solutions or if you need point-of-sales integrations. As you can see, there’s nothing really groundbreaking in either the good or bad factors. However, these are important things to know for your peace of mind. Unfortunately, there are also one or two catches when signing up with GoDaddy. For one, their domain registration renewal is usually $5, or more, expensive than most other domain registrars. So, although it’s great that you get it for cheaper for the first year, you might get a shock when you renew. The same goes for their WHOIS privacy and email forwarding, which are more expensive than most. Another thing to be careful of is that GoDaddy is notorious for their upselling strategies. It’s easy to accidentally end up paying for more than you originally intended to and is something you’ll always have to be wary of. Remember that while there are no other possible expenses in the form of purchasable apps or templates, this also means that you’re restricted to what’s offered out-of-the-box. Some people would rather pay more for a platform like Wix where they have a huge app market to choose from, or WordPress where they can purchase premium third-party templates. Taken together, what all of this means is that for those with modest requirements and who just want an easy, quick, and cheap way to host their website, GoDaddy may be just the ticket. However, there are also certain limitations that come with this affordability, and you won’t have the best features in any one category, such as e-commerce or blogging. 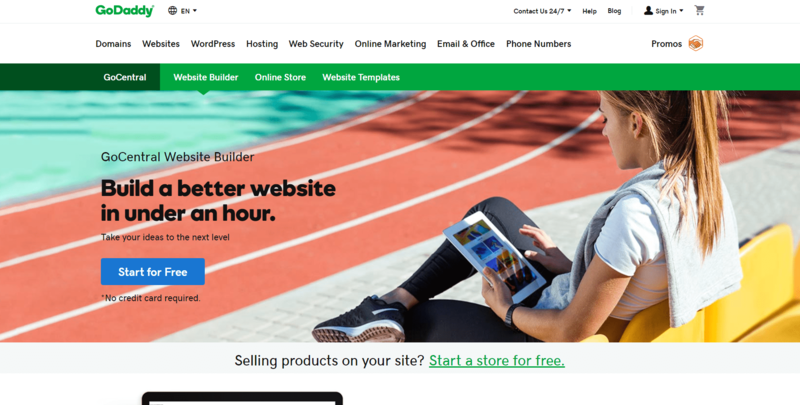 To learn more about GoDaddy’s website builder, feel free to check out our expert review or visit their pricing page.